Tens of thousands of dots speckle the map’s surface, each marking the death of a whale. Bowheads, right whales, humpbacks and more dapple the miles of ocean. The map is among the earliest data scientists have on the distribution and migration of whales. But researchers didn’t collect the 53,877 data points. Rather 18th and 19th century whalers scoured the oceans for the massive beasts, who were valued for their meat and blubber, and noted each kill in ship logbooks. In the 1930s, American zoologist Charles Townsend recognized the significance of these records, compiling the locations in a series of charts that provided the first big picture look at these creatures under siege. The map of killed whales does more than tug at the heartstrings. “It shows how far we’ve come,” says graphic designer Oliver Uberti, co-author of the new book, Where the Animals Go, which uses maps and graphics to give readers a peek into the secret lives of animals that traverse the globe. The whaling map is just one of 50 beautifully detailed illustrations that grace the pages of the book. Each map helps the readers to walk, swim or fly in the paths of wild animals—their myriad routes around the globe reflected in scribbles and tangles across the page. Most of the maps focus on recent research and cutting-edge tracking methods—GPS tags attached to turtle shells; barcode-like keys affixed to the backs of ants; “in-flight recorders” to measure the location, pressure, speed and acceleration of vultures; even fluorescent nanoparticles used to track the movements of plankton. 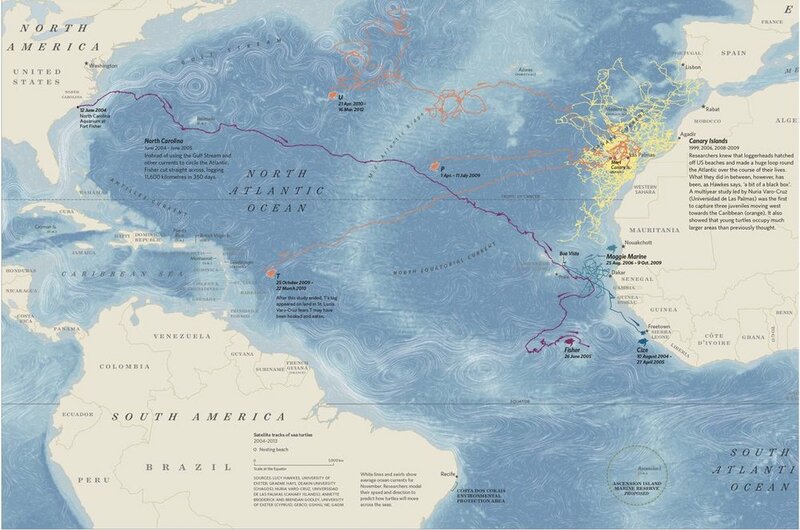 But the book also features several historical maps, including the one that uses Townsend’s repurposed whale data, to demonstrate just how much technology has transformed animal tracking and will continue to influence the way we think about and protect animals—from ants to owls to elephants. In the case of whales, the earliest “tags” took the form of harpoons, says Uberti. Researchers would engrave these weapons with unique identifiers and their address, driving them into animals spotted at sea. They would then offer a reward to whalers who returned the tags. This would give essentially two data points per animal: one when it was tagged, another when it was killed. Nowadays, technological advances allow scientists to track animals in a nonlethal manner while obtaining a stunning amount data. “Filling in those [data] gaps is [helping] researchers view animals on the individual level in unprecedented detail,” says James Cheshire, a geographer from the University College of London, who co-authored the book with Uberti. The duo explores a range of examples in Where the Animals Go. Scientists get cell phone alerts from the collars of elephants in Kenya. They can watch in almost real time as a wolf traverses the Alps, and they can even track the movements of badgers by the second as they move about their burrows underground. The idea for the book began with an elephant named Annie, who lived in the lands in and around Chad’s Zakouma National Park. In 2005, Uberti, then a designer for National Geographic, was invited to work on visualizations for a story about the devastating effects of poaching on elephant populations. In 1970 there were around 300,000 elephants in central Africa; by 2005, there were a mere 10,000. National Geographic sent a team, including ecologist Mike Fay and photographer Michael Nichols, to Chad to document the remaining herds—how they traveled, where they went and what threatened them. To do this, explains Uberti, they used what was at the time relatively new technology: a GPS collar. The team followed Annie’s every step for 12 weeks over 1,015 miles, mapping out a winding track through the savannah.